Lean UX open is 10% of UX open, including the best parts, happening many times per year! Lean UX open is a meetup taking place frequently (every other month or so) with 16 spots open to participants every session, providing the participants will prepare sharing something they know or have experienced concerning agile UX or lean UX in a 5-10 minute lightning talk and participate actively in the following open space discussions. The topics to prepare and share can be presented as simple as just talking about it, no PowerPoints necessary (but the option exists if you want to). You can find a more vivid example of how the Lean UX open meetup works here. The next meetup event might be full, but join the waiting list and prepare a talk anyway, there are usually many drop outs during the last days before the meetup. The open space discussion were about how to create hypotheses that work as user stories, how to measure the value of UX, how to get developers to be more UX:y and teaching UX principles to everyone around you. The open space discussions entailed how to survive in a waterfall organization, best practices on how to get people to buy in to LeanUX methods, some more about sharing user insights and how to get a continuous feedback loop with a limited amount of users far, far away. Anneli spoke about helping the whole team to empathize and connect with the user. Maryam explained how she decided not to innovate in the project, when she found that there already was a pile of ideas. Martin proposed doing mob design instead of design studio, since mob programming is very successful (in the teams that dare to try it). Annika spoke about risks when doing Lean user research, stuff that you miss out compared to when doing "full" user research. 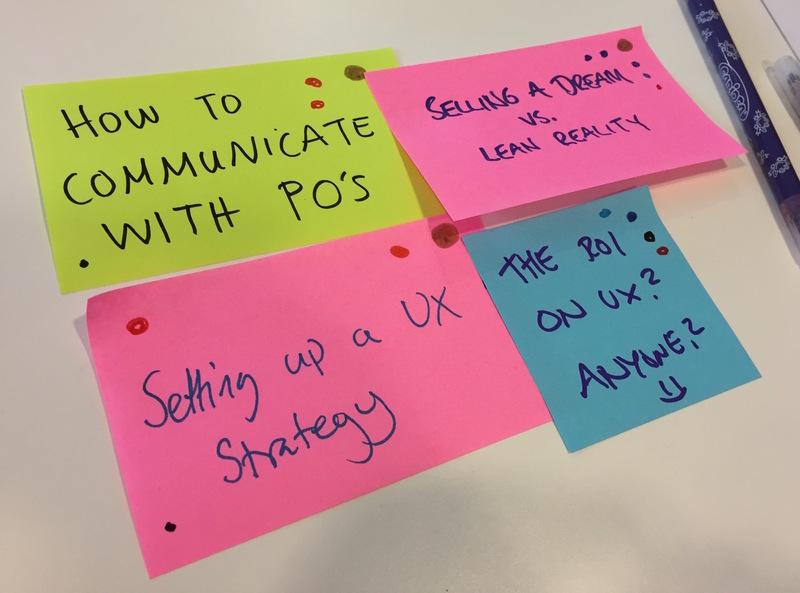 The open space discussion were about how to recruit good UX people, how to remotely do user research, what basic structure that need to exist in a company for enabling UX work (such as buy-in and understanding) and if the UX role will disappear in the future. Martin spoke about comparing traditional UX with LeanUX using the Design Thinking framework. Video in Swedish here. Chris explained how he used the role of critique in the design studio process. Maryam talked about different bias in user research and to always count that in. Dan described how he had used trigger material during interviews to get a deeper understanding. Hans discussed a hunch he has about why designers only do iterative stuff, developers do only incremental stuff, and how to combine them fruitfully. We ended with a discussion about several interesting topics intertwined. Jens spoke about Pirate Metrics, a few key metrics to be used for a good enough analysis of the business. Nina explained how she onboarded herself as a UX person in a distributed team who had never worked with a UX person before. Nina used story maps, high-level mockups and story telling. Martin talked about how to do easy-peasy user selection before research and test, and told an anecdote about a current project where user selection made all the difference. Dan described how he kicked off a workshop using simple design templates and got people to be more creative by setting boundaries. Hannes told us about doing Service Design and not just delivering a document but actually continuing the project with the same group of people doing LeanUX methods. And also about doing LeanUX with the support of Service Design thinking. Christopher talked about how Johnny Cash had given him a metaphor for agile development and what he thought was lacking in it. He found salvation in Jeff Patton's Story Mapping exercise and explained how he had performed it. Martin #1 had a talk about how to create effective teams. He had some great ideas about how to help with team collaboration and understanding, such as visualizing your mental state of the day during the morning meeting so that everyone understands how you feel and can approach you in the right way during the day. Martin #2 spoke about how the Discovery phase and Delivery phase of Agile could work together by using the Build-Measure-Learn cycle in both these phases to support both exploratory work and actual production. The following discussions were about how to present research findings in a great way to the rest of the team, how to help your team to collaborate and questions and details about some of the above mentioned talks.